I have been thinking for the last few days on where I was 5 years ago in my student affairs career. The one thing I keep coming back to is the question asked during evaluations and in interviews - Where do you see yourself in five years? I would flinch when hearing this question, knowing I'm not futuristic. 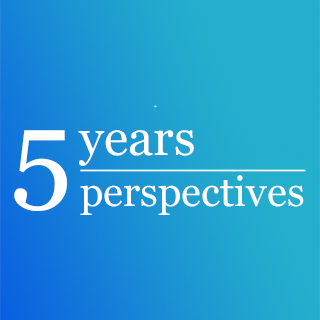 I thought, “in five years will this question really matter?” However, when I close my eyes and think back to five years ago, I was an entry level professional in my first year as a Residence Life Coordinator in housing. The position was a challenge, exciting and was even more than I expected. I was transitioning back into housing, living on campus in a new city and region (the Midwest) and supervising my first graduate student. Here are five perspectives I have learned over the last few years in the field. Learn. In five years, I have realized you are continuously learning during graduate school and as a professional. I have questioned at times – have I learned it all yet? The learning process continues each day in my role with student needs evolving, my position responsibilities changing and my experience in the field growing. One of my best decisions I made was keeping my graduate course books for references. Challenge. Leaving my graduate co-hort, the regional normal I knew from growing up in the east coast, and the closeness of stores - was different. I was stepping outside of my comfort zone and my norm. I totally agree with the suggestion to live somewhere new as a new professional. Things will be different and it is okay to recognize that to find what you need to be happy. After becoming comfortable about what I saw as challenges in living in a new area allowed me to start exploring to make a new norm. Observe. Being a new professional in a new group, I had to find my voice. In graduate school, we talked about ideas and were so excited to be in the mix of other student affairs professionals. When I moved to a professional role, I was not the expert in the room but the new to learning the position and the institution. At times when pitching ideas needed to know how the new direction would fit into the institution's culture. I recently started a new position and have been in my observe mode. This has allowed me to learn before jumping to new ideas. Direction. Five years ago, I was asked where I thought I would be in five years. Five years ago, I would have said, I plan to be in a mid-level position and working in housing. The details of how I got there I was not sure of at the time. After graduate school, I wanted to get my feet wet once more in housing. During my third year as a professional, I had an opportunity to work with an all-female population. I was excited to change up my area of work but did not know it would open the doors and light a fire in me to continue in working with this population. The last five years have impacted and laid the foundation for my student affairs professional career. As I enter my second full-time position, I’m excited to see what I learn, overcome, observe, and choose the best direction my student affairs career.